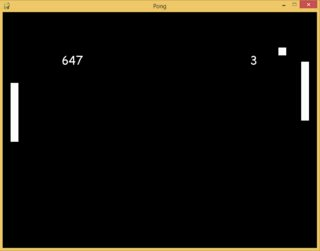 I have been studying Python for a few months and just recently decided to stop avoiding OOP and reworked a Pong game to a more object oriented style. Please tell me how I should improve my code. Some of the code is an adaptation from this Stack Overflow question about menu state. There is a known problem with the MenuScene.handle_events() function, such that I need to press the space or return key multiple times to it catch the event, but I don't consider it to be a significant bug. By placing the paddle in a specific position I managed to break the game (see the image). I think you should add a random starting angle when the game restarts. Also, as Wikipedia says the game should be finished once someone reaches eleven points. In some methods like GameScene.update or Player.update you have empty return or pass statements after code blocks. They are redundant and should be removed. I think it would make sense to move lots of hardcoded values as fonts and dimensions of objects to the config.py file though. Also, be careful, some of your hardcoded values depend on each other, as in the Player class where you check if the paddle is going over the border. That 10 in if up and self.y >= 10: should be tied with the paddle's dimensions super(Player,self).__init__(20,225,20,150). By the way, the last piece should be rewritten as super().__init__(20, 225, 20, 150). It's been like this since Python 3.0: PEP 3135 -- New Super. Finally, don't print things like print("player class initated"). As these things are for debugging purposes, consider using logging module. On overall, well done! I'm not a fan of OOP but it was easy to read and understand your code. Not the answer you're looking for? Browse other questions tagged python beginner object-oriented pygame pong or ask your own question.